On Friday, VP Administration hopefuls Cole Evans, Andrea M. Hurtado Fuentes and Alex Okrainetz met again to deliberate every aspect of the portfolio, from sustainability and room bookings to club governance and the AMS Sexual Violence Prevention and Respectful Environment Policy (SVPREP). After a timid first debate, the candidates upped the pressure by questioning the feasibility of each other’s platform points. 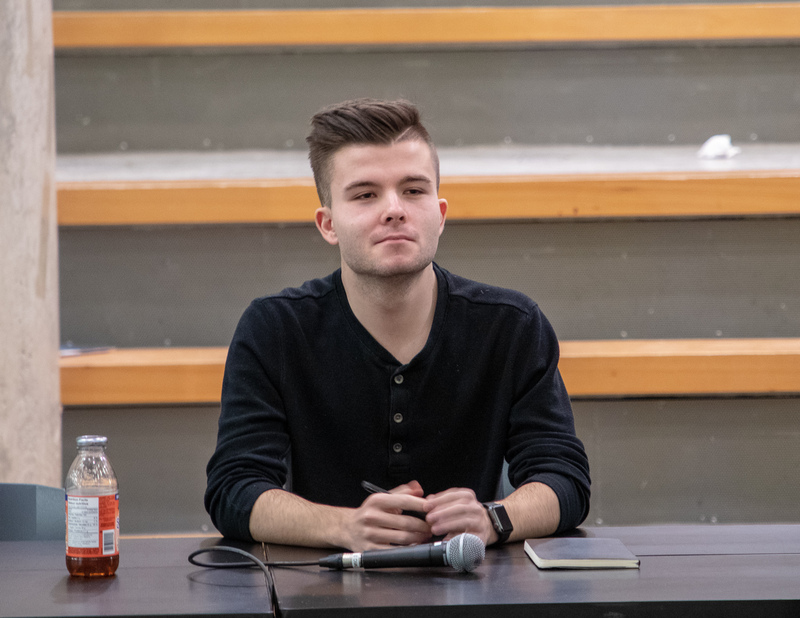 After opening statements the candidates were asked how they would improve the club bookings system in the Nest — a longstanding platform point for VP Administration candidates. Okrainetz and Fuentes expressed hesitation towards a complete overhaul and instead proposed that they would work improving the current system. Okrainetz promised a more “slow and calculated” look at the bookings system by consulting with clubs and staff members to see what aspects of the system weren’t working for them. Fuentes challenged Evans’ proposal to move the entire system online, arguing that some bookings need to be handled on a case-by-case basis. “If it hasn’t happened so far it probably won’t happen, because it’s actually not feasible to have an online booking system,” she said. Evans dug into his position, arguing that just because it hasn’t been done by VP Administrations in the past doesn’t mean it isn’t possible. “We’re going to change the bookings system, we’re going to move it online and we’re going to make sure clubs have access to those booking resources,” he said. The candidates then moved on to discuss club ‘over-governance’ by the VP Administration portfolio. Okrainetz and Fuentes were able to draw on their experiences as club executives to give examples. Okrainetz pointed to “expulsions [from clubs] by a single email,” which she’d heard from other students. Fuentes noted the AMS tended to ‘over-govern’ club finances and signing contracts which limits club’s ability to handle their operations. The Ubyssey fact-checked that: since the AMS is the legal entity for clubs, only they have power to sign contracts. Evans was more general in his response, arguing it was the job of the AMS to support clubs and groups and up to clubs themselves to decide what examples of ‘over-governance’ were. Okrainetz then expressed concern that Evans, whose platform heavily involves limiting AMS ‘over-governance’ of clubs, could not provide a single example. Evans responded that since he was not a club executive “[he didn’t] have all the answers,” and he would work to consult with clubs to determine what counted as over-governance to them. 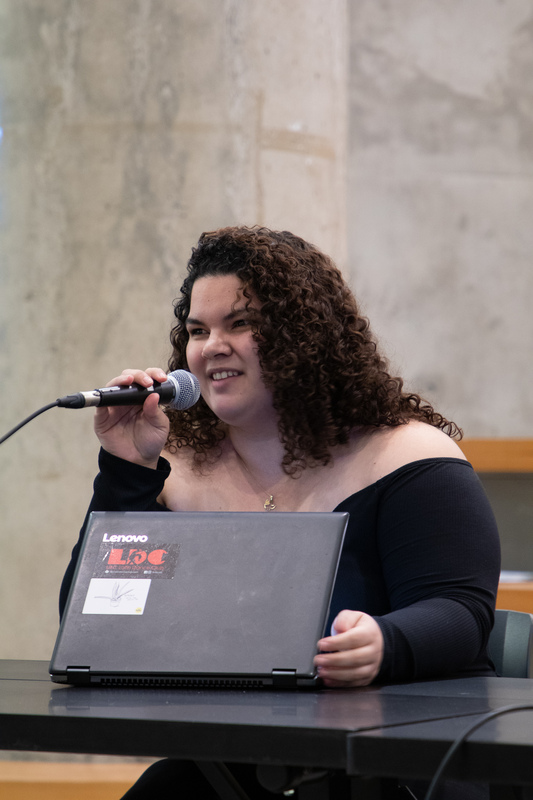 Fuentes further challenged Evan’s platform promise of club autonomy, arguing the AMS needed to have boundaries in place since they are legally liable for club activities. Evans accused her of hypocrisy, drawing on her earlier sentiment of wanting more autonomy for clubs to sign contracts themselves. The discussion then moved on to how the candidates would handle the sustainability aspect of the VP Administration portfolio. All three candidates agreed that supporting student-led initiatives would be paramount in prioritizing sustainability. Okrainetz echoed her platform point from the first debate about moving the AMS Sustainability staff up to the AMS office. During his response Evans passive-aggressively thanked her for emphasizing his platform point, which led to animosity and confusion as the candidates accused each other of stealing platform points. 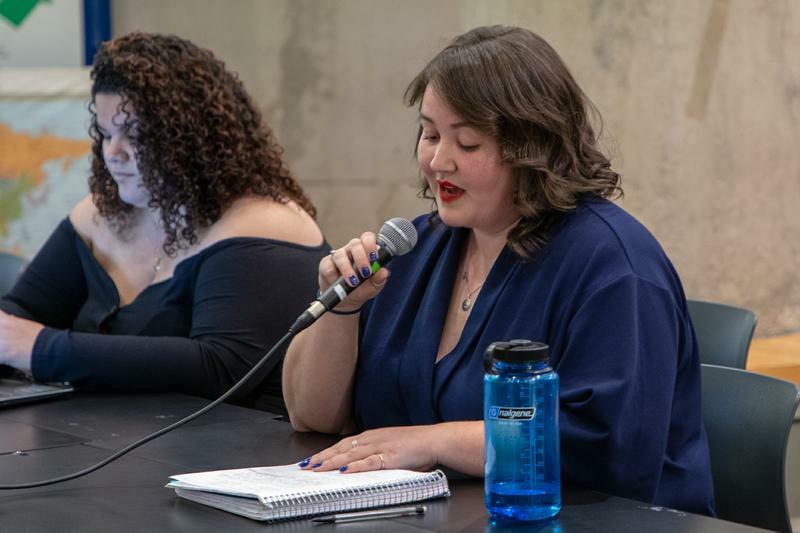 Okrainetz further emphasized her expertise in this area and advocated for making an inventory on single-use plastics and ensuring students are informed about proper waste sorting. Fuentes agreed with Okrainetz on proper waste sorting and advocated for giving clubs more access to sustainable resources for events. Evans advocated for more sustainable resources in the businesses such as container sharing programs, like MugShare at Blue Chip, to reduce single-use items. An audience member then asked the candidates to name all the resource groups and how they would support them. Okrainetz was able to name every resource group except the Women’s Centre, which Evans took the chance to point out. She also said she would consult with resource group leaders and students who used them to best understand how to support them, but was scant on details. The second audience question asked candidates how they created their platforms. She further questioned how he would juggle his extensive platform as the VP Administration. The next question involved what candidates thought of the draft of SVPREP, the AMS’s stand-alone sexual violence prevention policy, which also includes provisions for expelling club members. Okrainetz echoed her response to a similar question asked in the first debate, adding that the clear definitions would be helpful during the policy’s implementation. Evans used most of his time to respond to Okrainetz’s earlier question about his ability and willingness to enact his platform, adding a brief statement about ensuring “clarity” about SVPREP. “I’ve thoroughly enjoyed my AMS time and I’m ready for more work so don’t worry about that,” he clarified. The final question came from current VP Administration Chris Hakim, who asked candidates how they would handle disclosures of sexual assault and misconduct. Fuentes said her experience receiving disclosures as a residence advisor as well as SASC training prepared her to handle disclosures. She also emphasized her platform point to provide peer support training to club executives so they were well-equipped to handle those situations as well. Okrainetz said the best response would be giving survivors space and options. Voting for the AMS elections will take place March 11 to 15.